A leading Damascus cleric who fled Syria has been chosen at a meeting in Qatar to head a new coalition to oppose President Bashar al-Assad’s government. 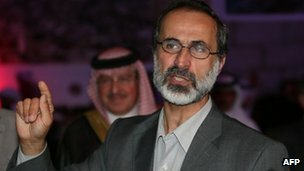 Sheikh Moaz al-Khatib, who is 52, left Damascus for Cairo in July after several periods of detention by the Syrian authorities. As he signed the draft agreement that formed the opposition coalition with Syrian National Council head George Sabra, Mr al-Khatib called on the international community to “fulfil its pledges”, the AFP news agency reported. Last month he called for a political solution to save Syria from further destruction, arguing that negotiation would not “rescue the regime” but enable its departure with the least harm possible. More than 36,000 people have been killed in the long-running uprising against President Bashar al-Assad’s government. BBC Beirut correspondent Jim Muir described the coalition’s leadership as a carefully balanced team that was set to become the face and voice of the Syrian opposition in the coming phase. One source at the meeting told Reuters that the SNC had agreed only under pressure and that it had been given a deadline of 10:00 (07:00 GMT) to sign up or risk being left out. The new body had been proposed by Mr Seif with the backing of the US, which had signalled its frustration with the SNC. “We signed an agreement to create [a] coalition of 60 members of the Syrian opposition,” he said. Delegates said the body would carry representation for ethnic Kurds, Christians, Alawites and women. Of the 60 places, 22 will be reserved for the SNC. 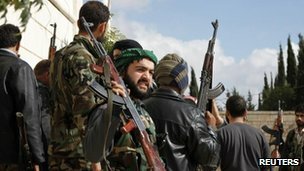 The BBC’s Jim Muir, who was in Doha as the talks began last week, says the backers of the new body hope it will boost the mainstream of the Syrian opposition and sideline any extremist elements. Turkish Foreign Minister Ahmet Davutoglu, who was in Doha for the culmination of the talks, said there was “no excuse now” for the international community not to recognise the Syrian opposition.